7 AM GUESS WHAT ITS RAINING. 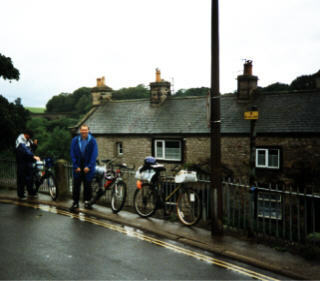 WE WERE ON OUR WAY IN THE DRIZZLE .I HAD A PROBLEM AND MISREAD THE MAP, AS SUCH WE CROSSED THE A65 EARLY AND RODE INTO AUSTWICK. 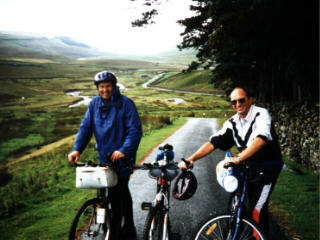 IN THE POURING RAIN BETWEEN AUSTWICK AND CLAPHAM WE SAW AN OS MAP VAN GRAEME SAID TO COLIN I HOPE THEY DONT ASK OUR MALCOLM FOR DIRECTIONS. 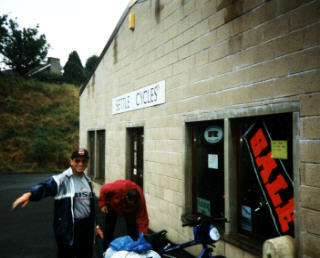 AS WE RODE FROM CLAPHAM TO INGLETON IT WAS TORRENTIAL RAIN WE EVENTUALLY GOT TO INGLETON. 12 NOON, CAFE- TEA AND TEACAKES. WHILE IN THE CAFE THE RAIN STOPPED. KINGSDALE WAS A QUIET DALE NO CARS. 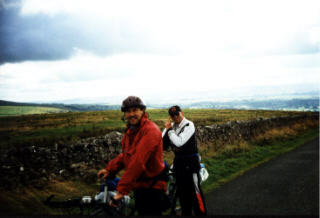 APART FROM THE ODD ADJUSTMENT IE COLIN LOSING HIS CAP AND HAVING TO RUN BACK DOWN THE HILL HE HAD JUST CYCLED UP TO RETRIEVE IT .THE DAY WAS IMPROVING ALL THE TIME ALTHOUGH THERE WERE SOME LONG PUSHES AND SHARP DESCENTS, WHICH WERE VERY REWARDING. THE DESCENT INTO DEEPDALE AND THE RIDE DOWN WAS WONDERFUL I THINK MY FAVOURITE POINT OF THE RIDE. DEEPDALE IS A VERY PRETTY DALE WONDERFUL WATER FALLS AND VERY QUIET. HAWES STILL 14MLS AWAY. WEATHER PLEASANT GRAEME WAS IN GOOD SPIRITS KEEPING EVERYONE GOING, COMING OUT WITH COMMENTS LIKE NO PAIN NO GAIN AND YOU'VE GOT TO BE KICKED TO ENJOY THE GOOD TIMES. 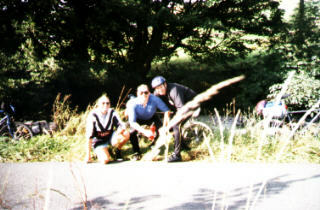 DENT TO COWGILL WAS A LONG STEADY CLIMB WHERE WE PASSED THE HALFWAY POINT. I WAS STRUGGLING A LITTLE AND HAWES SEEMED A LONG WAY OFF. A MARS BAR AMD HONEY BAR GOT ME GOING AGAIN. 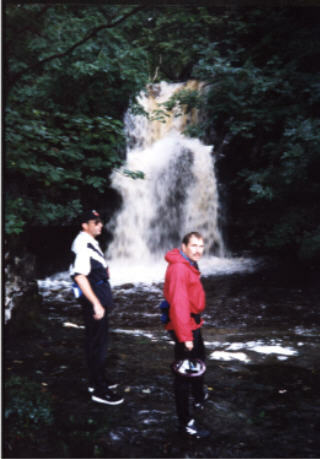 WE HAD A LONG PUSH OUT OF COWGILL UP TO WIDDALE UNDER THE SETTLE\CARLISLE RAILWAY COLIN SAID, HERE COMES A TRAIN WHEN IT WAS REALLY A NOISE FROM AN AEROPLANE. GRAEME SAID HE WOULD BE NO GOOD AS A MISSILE LAUNCHER IF HE CAN'T TELL A TRAIN FROM AN AEROPLANE. WE EVENTUALLY GOT TO WIDDALE TOP AT 6PM, THEN IT WAS A WONDERFUL LONG RALLY DOWN TO HAWES SUN SHINING, FREE WHEELING, GREAT. 6:30PM HAWES. ALL WENT WELL UNTIL A FORK LIFT REVERSES INTO MY PATH FOLLOWED BY A CAR I HAD TO SWERVE AROUND BOTH. 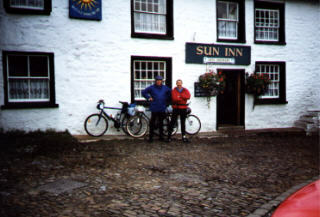 FOUND THE DIGS VERY COMFORTABLE GOOD NIGHT OUT IN HAWES GOOD BEER.COMMENT OF THE DAY, COLIN TO GRAEME "WHERE ARE WE GOING, WHY ARE WE GOING THIS WAY" GRAEME "ITS THE YORKSHIRE DALES CYCLE WAY" COLIN "OH I THOUGHT IT WAS SOMETHING OUR MALCOLM HAD MADE UP"